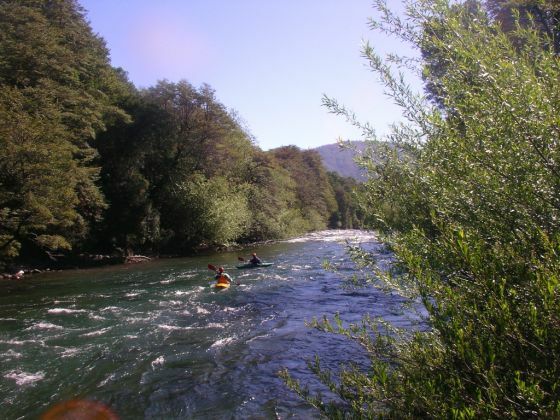 The crystal clear, iridescent waters of the Maichí­n are home to one of the Pucón area’s classic rivers. Set in an incredibly beautiful canyon the Maichí­­n has everything one could ask forsolid class 4/5 whitewater, excelent fishing, natural streambed, consistent flow, and easy access. Maichí­n in the local dialect of the Mapuche signifies “To make signs” which refers to signs of greetings such as waving. 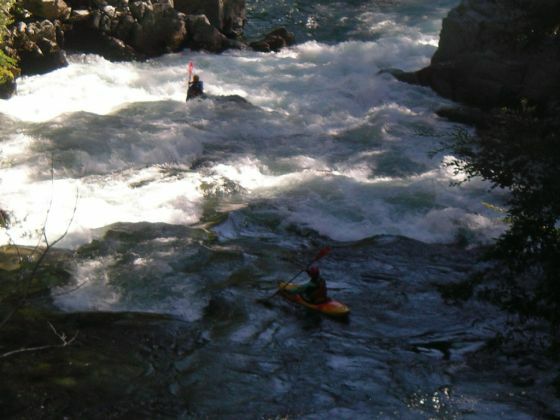 The Maichí­n runs for most of the summer months but is best in the month of December and early January when higher flows in the 1000-1500 CFS range make for some powerful hydraulics and long explosive rapids. The river is run through the period January-March but the falling flow takes away “the punch” of December flows and can be very rocky. Venturing in during high flows of the winter months is possible but unless one already knows the river it is highly discouraged. To reach the takeout drive 36 KM east on the paved road from Pucón to Curarrehue. On the eastern side of town turn left and cross the Trancura river bridge following signs for Re­golil. Go 8.5 KM and you will reach a high bridge over the Maichí­n. Cross the bridge and make the first left and follow this road approximately 2 KM downstream to the takeout point. The takeout point is somewhat arbitrary but can best be found at the point just where the road finishes going downhill and also before it starts to go back uphill. There is a place to park on the left and a gate into a field on your left side. The river is accessible via a 100 meter walk thru the field. There are some small beaches here at this takeout so if the weather is nice it is a good place to hang out for shuttle drivers and people with kids. Be respectful as this is private property and do not park your vehicles inside or block access to the gate. To reach the put in head back upstream 2 km to road junction. Continue on road to Re­golil another 6 KM until you can finally see the river at a point where it is only 10 meters away from the road. Park on this level spot and walk to the river. The first 1 km is pretty mellow and passes under a bridge then the river starts to enter a canyon with some class 4 drops. On the run you will come to a class 5+ rapid dubbed “Achtung Baby”. Portage on left with care or run the drop with care. The reason I say portage with care is because the last part of the portage (if done on river left) involves a seal launch back into the river and the strong current pushes unsespecting boaters into an undercut wall. Multiple large holes need to be punched while running this drop and three distinct undercuts magnetically attract the daredevil kayakers. Further into the run comes a crux section which often involves a scout on river right and then an unscoutable horizon line. When you run part one of this drop and are approaching the unscoutable part two choose the center chute and launch straight off the far left side of this chute to avoid a hole at the bottom. 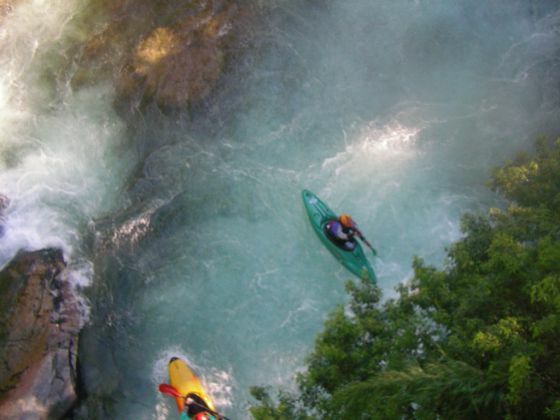 This 2-3 hour run can be combined with other nearby runs such as Puesco or Panqui to make for a very full day of kayaking. Note: There is a class 3-4 section above the common put-in that sports one distinct canyon section. To extend or modify the run continue upstream towards Re­golil and stop wherever you see something you like as the river is basically visible from the road on most of this section.